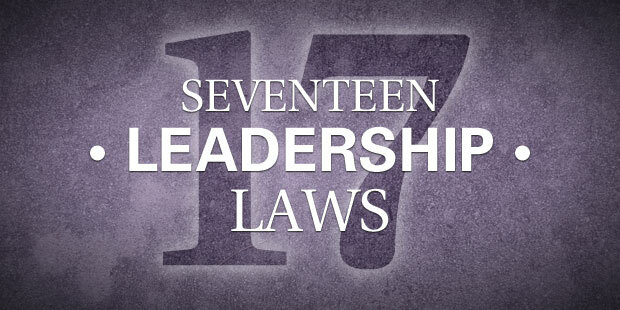 In honor of John Maxwell, who could come up with 1700 leadership laws, here are 17 of mine. 1. Tough decisions only get tougher. You are only one decision away from a totally different life. I believe that. One change in diet or exercise can radically change your health status. One change in spiritual disciplines can open up new dimensions of grace and power. One change in a relationship can lead to intimacy. What do you need to stop doing or start doing? Your destiny isn’t a mystery. Your destiny is the cumulative decisions you make. What tough decision do you need to make? What are you waiting for? 2. Negativity is cancer. Kill it or it will kill you. I am wide open to rebuke. Constructive criticism is the avenue to excellence. But I have zero tolerance for negativity. How do you stop negativity? Positivity. One of the ways we do that at NCC is sharing wins before every meeting. It reminds us that God is moving and we get to be part of it. Sharing wins creates positive energy. And it’s positivity that gives us the energy we need to deal with negativity. Don’t let one staff member, one board member or one small group member hijack what God has called you to captain. 3. No Margin = No Vision. If you try to be all things to all people you’ll become nothing to nobody. I have focus days and meetings days. I meet with people on my meeting days. I meet with God on my focus days. I need days where there is nothing on my agenda so I can read or write, dream or rest. The lack of margin will kill your creativity. If you don’t control your calendar your calendar will control you. It starts with establishing boundaries. Then you need to guard against the Messiah complex. You can’t save everybody. In fact, you can’t save anybody. You aren’t doing anybody any favors if you make yourself available to everybody all the time. Take a break. Take a day off. Take a vacation. Take a sabbatical. 4. If you listen to God people will listen to you. People don’t need a word from me. They need a word from God. I want my messages to have a prophetic edge to them and that happens when I get into the presence of God. The presence of God is where problems are solved and dreams are conceived. Get in the presence of God. At the end of the day, I am nothing without God’s anointing. I need to keep an ear tuned to the people, but more importantly, I need to keep an ear tuned to the still small voice of the Holy Spirit. 5. Don’t let your budget determine your vision. Too often we allow our budget to determine our vision instead of allowing vision to determine our budget. That doesn’t mean you hire lots of staff you’ll need to fire. It doesn’t mean you let expenses get out of control. It does mean that you hold tenaciously to this simple truth: when God gives a vision He makes provision. You need to budget in a way that gives God the room to do miracles. And make doubly sure that you have vision beyond your resources. One of the greatest dangers we face as leaders is inattentional blindness. We stop noticing our environment. When that happens we lose creativity, we lose excellence. You’ve got to make some mistakes! You’ve got to take some risks. Over time there is a cognitive shift from right-brain to left-brain: we stop doing ministry out of imagination and start doing it out of memory. Do something different. After all, if you want God to do something new then you can’t keep doing the same old thing. 7. If your life is interesting your messages will be interesting. The reason why many of our messages lack impact is because they aren’t interesting and they aren’t interesting because we’re not interesting. Get a life! You need a life outside of church. Go on an adventure. Take up a hobby. Learn something new. 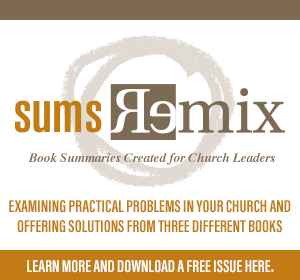 If your life is boring, chances are that your sermons will be too. 8. Don’t just dream big. Think long. We tend to overestimate what we can accomplish in 2 years, but we underestimate what we can accomplish in ten years. Zoom out. Your mantra shouldn’t be “as soon as possible.” It should be “as long as it takes.” Your vision isn’t just too small. It’s too short. At the end of the day, I want to be famous in my home. God has not called me to sacrifice my family on the altar of ministry. They deserve my best. Don’t let work become home and home become work. Success for me is my kids growing up to love God with all of their heart, soul, mind, and strength. Your youth pastor isn’t called to disciple your kids. You are. You’ll make mistakes, but the secret to successful parenting is this: keep trying, keep forgiving, keep loving. 10. Who you’re becoming is more important than what you’re doing. Don’t worry about church growth. Focus on personal growth and church growth will take care of itself. Stay humble. Stay hungry. Make sure you’re doing ministry out of the overflow of what God is doing in your own heart, your own life. Remember that who you are is more important than what you do. People over programs. People over portfolios. 11. Work like it depends on you. Pray like it depends on God. Failing to plan is planning to fail. So plan away. And loving God with all of your strength = a great work ethic. So work hard. But I believe in prayerstorming more than brainstorming. Prayer is the difference between you fighting for God and God fighting for you. If work is the engine of success, then prayer is the high-octane fuel. 12. If you have something to say, say it. My greatest regret looking back over fifteen years of preaching? Simple: I wish I had communicated the gospel more consistently and more clearly. I should have said it and said it again and again and again. You cannot over-communicate. Say it. Then say it over and over again. Say it in different ways. As a multi-site church we have a mantra: when in doubt, CC. Another mantra is this: don’t internalize, verbalize. I don’t want to hear about issues when they’ve become full-blown problems with collateral damage. Internalizing issues only makes them worse. And I don’t want to hear it from a third-party. If you have something to say, say it. Don’t try to be who you’re not. I’m not trying to be a pastor anymore. I’m trying to be myself. I’m certainly trying to grow in maturity and gifting, but I’m not worried about who I’m not. Abraham Lincoln said, “You can please all of the people some of the time, some of the people all of the time, but you can’t please all the people all of the time.” Uniformity isn’t the goal. Unity is. That also doesn’t mean unanimous. According to the categorization of adopters, 16% of the people you lead will be resisters. It doesn’t matter if you come down with stone tablets from Mount Sinai. Even Jesus lost one of his disciples. 14. Don’t live for the applause of people. My philosophy of ministry is Matthew 10:16: Be shrewd as a snake and innocent as a dove. You’ve got to beat the enemy at his own game and that takes creativity. But you also need to do the right things for the right reasons and that takes integrity. Don’t worry about being politically correct. Be biblically correct. Most of my reward has been forfeited because I was more concerned about “my kingdom” than “thy kingdom.” I was living for the applause of people. To get to the point where you genuinely care for people you have to get to the point where you don’t care how they feel about you. Live for the applause of nail-scarred hands. 15. I’d rather have one God idea than a thousand good ideas. Let me say it again: get in the presence of God. Those new ideas are discovered in the context of prayer and fasting and nowhere else. Good ideas are good, but God ideas change the course of history. There are ways of doing church that no one has thought of yet. Here’s a formula: change of pace + change of place = change of perspective. Sometimes you just need to get out of your routine. 16. You cannot break the law of sowing and reaping. If you want to receive honor then you need to give honor. 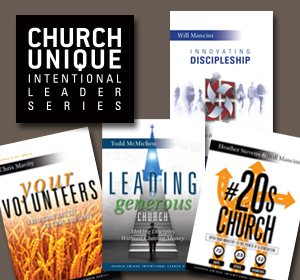 If you want a generous culture, then you’ve got to give sacrificially. Set the example. Set the bar. At the end of the day, the strengths and weaknesses of any organization mirror the strengths and weaknesses of the leadership. Take responsibility for it. Then take action. For better or for worse, you cannot break the law of sowing and reaping. If you are too focused on the future you’ll fall into the when/then syndrome. When we have “this many people” or “this much money” I’ll be able to enjoy leadership. No you won’t. You need to enjoy every stage. For the record, it will only get harder. It will only get more complicated. Sin will complicate your life in negative ways. Blessings will complicate your life in positive ways. When I got married it complicated my life. Praise God. We have three complications named Parker, Summer, and Josiah. I can’t imagine life without those complications. So count the cost and keep on keeping on. Mark Batterson serves as lead pastor of National Community Church (www.theaterchurch.com) in Washington, DC. One church with seven locations, NCC is focused on reaching emerging generations. The vision of NCC is to meet in movie theaters at metro stops throughout the DC area. NCC also owns and operates the largest coffeehouse on Capitol Hill. Mark has two Masters Degrees from Trinity Evangelical Divinity School in Chicago, Illinois. He is the author of the best-selling books: In a Pit with a Lion on a Snowy Day, Wild Goose Chase, Primal: A Quest for the Lost Soul of Christianity, and Soulprint. Mark is married to Lora and they live on Capitol Hill with their three children: Parker, Summer, and Josiah.